Me soooooooooooo hungry now, just want to go ahead and break my resolutions for not eating any junk food. Even had museli, an hour ago, but still feeling oh so hungrrrrrrrrrrryyyyyyyyyyy. What to do? So, while deciding upon what to eat or get another cup of green tea, to calm my mind and hunger pangs (of course!!! ), I decided to write a post, about my current favorite face care product. 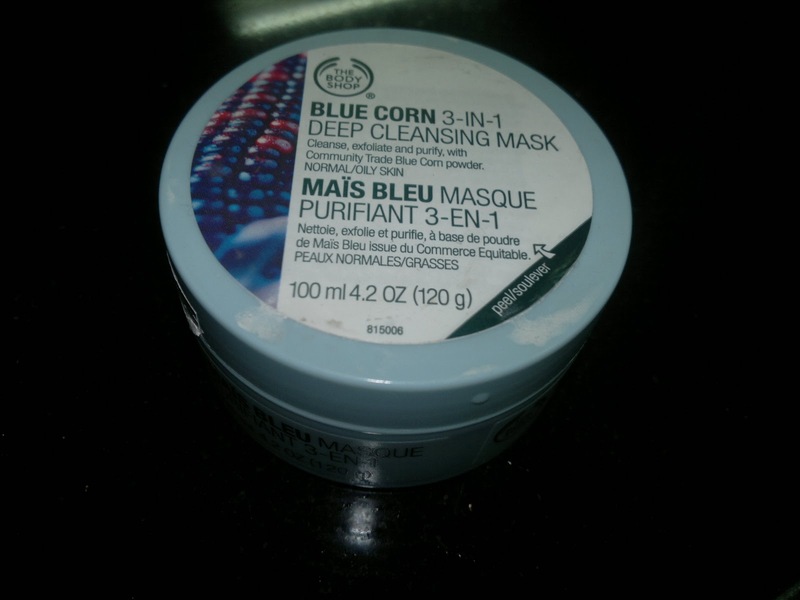 it is the Blue corn 3-in-1 deep cleansing mask from The Body Shop (TBS). Price: INR 830 (I got it on 20% discount about a month back). Quantity: 100 ml. Comes in a round tub. As with all TBS products, complete ingredient list is mentioned on the tub itself. The paste is light blue in color, with a thick paste like consistency. 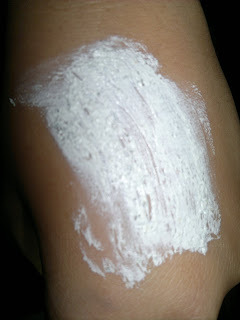 As you can see in the swatch below, the paste has minute granules also. Usage instruction: Cleanse skin and pat dry before applying a generous layer of the mask to the face, avoiding the eye and lip areas. Leave on for 10 to 15 minutes before rinsing with warm water (mask will not dry). Use one to two times per week after cleansing. 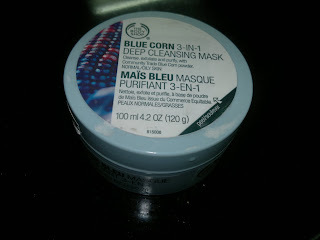 My experience with this mask, has been just amazing. I have normal to oily facial skin, which is generally clear, with the exception of my chin, prone to breakouts. It has taken care of all my skin problems, though the smell feels pungent for as long as I apply the mask and the mask sting my face (not too badly of course). But people with sensitive noses and skin might not find this useful / tolerable. First usage had me completely zonked out. 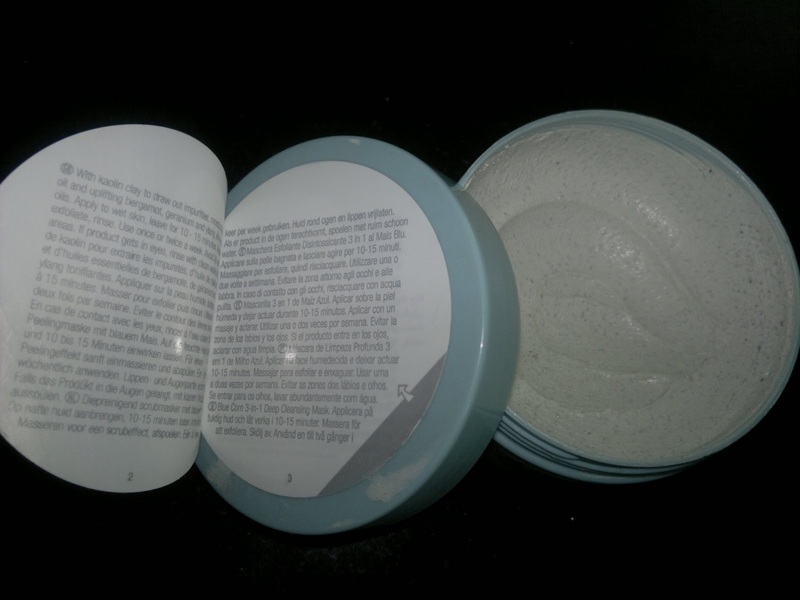 I applied it as a mask, waited for about 5 minutes till it felt semi dry, moistened it a little bit and scrubbed my face gently as the granules are hard and felt as if they would scratch my skin. Already while scrubbing I could feel my skin to be softer and firmer. After scrubbing for a minute or so, I washed this off my face and lo and behold! I saw clear and radiant skin with no blackheads, or white heads. As, a final test, I patted my skin dry and it felt firmer and bouncier than before. As mentioned in the instructions, I don't use this pack twice a week, but once a week, alternating it with my NeoVeda scrub. But, this has completely taken care of my problem area, which is my chin, which is where I break out generally. Before, any of you decide to buy this, do check it out at the TBS shop, they would do a patch test on your skin, and also smell it beforehand. So, all you busy ladies looking for a quick facial (who don't mind the smell and don't have very sensitive skins), for which I generally don't have time, this could be your ticket to a radiant skin in a jiffy. Like when your beloved makes on the spot plans or you have a family get together to attend, this could well be your rescue ticket. It will make you look all radiant and glowy without a visit to the beauty parlor. I for one don't have regular facials as most of them break me out, this product has been a boon in disguise for me, though a little expensive. But, as you can see from the tub, I have used it for over 4 weeks now and still I have more than half the product left with me. My product rating would be A. Would definitely be repurchasing this all my life unless TBS decides to discontinue this!! !